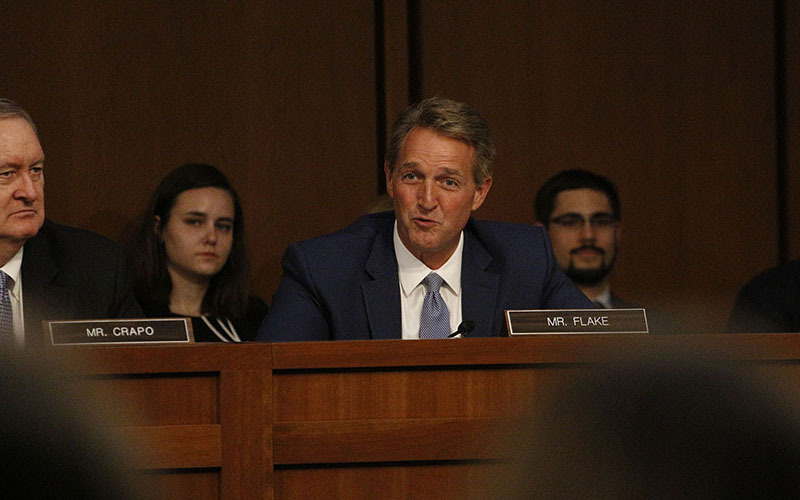 WASHINGTON – Supreme Court nominee Brett Kavanaugh dodged pointed questions Wednesday from Sen. Jeff Flake, R-Arizona, on the separation of powers and whether the president can be shielded from obstruction of justice charges while in office. The questions came during the second day of Senate Judiciary Committee hearings on Kavanaugh’s nomination and the first full day of questioning by senators, with Democrats digging deeply into a judicial record that they consider out of the mainstream. 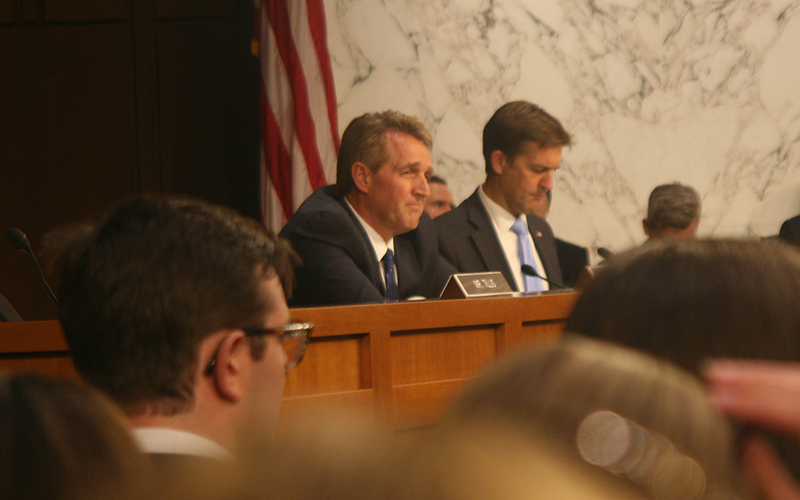 GOP questions were generally more friendly – Flake opened by asking Kavanaugh who his role models are – but some were pointed. In response to the question of shielding the president, Kavanaugh called it a political scenario and a hypothetical that he could not discuss. Flake had been asking specifically about recent tweets from the president that attacked Attorney General Jeff Sessions for letting investigations of GOP lawmakers move forward, asking Kavanaugh whether that constituted illegal pressuring of a government agency for political purposes. When Kavanaugh demurred, Flake tried again with a more generic phrasing, asking whether presidents should be able to exert pressure on agencies under the executive branch for political purposes. Kavanaugh would not bite. “I think that hypothetical that you’re asking is directly analogous to the current events, therefore I hesitate to get in to … commenting on something that’s not a case or an issue or something I’ve written about,” he said. After Kavanaugh talked about what general restrictions exist on a president’s authority, Flake zeroed in on how it related to Office of Special Counsel. “If the president could fire the independent counsel or a special counsel, is that any restraint at all?” Flake asked. Critics have pointed to law review article by Kavanaugh – who worked in the George W. Bush White House and on the team of Special Counsel Kenneth Starr in the investigation of President Bill Clinton – that suggests there are situations under which a sitting president should be shielded from prosecution. Kavanaugh said the question of a statute’s ambiguity is open to interpretation of any judge it comes before. Flake’s final line of questioning concerned 2005 Supreme Court case, Kelo v. New London, which extended the right of eminent domain, or the power of the government to seize private property for public use. According to Oyez.org, the decision resulted in a broader interpretation of what qualified as “public use” under the takings clause of the Fifth Amendment. Flake said that with 85 percent of land in Arizona already in public hands, the ruling is of great concern. “It’s in my view a terrible precedent … within Arizona and Western states with so little private property as it is,” Flake said after the hearing. Kavanaugh said he had given court standing to litigants whose property had been seized in some cases, adding that Easterners often did not understand the scope of how much land in the West is public.